Girl Scouts learning about the Red Cross on Career Night in Port Jefferson. News 12 Bronx had terrific coverage over our teams in the Bronx Sunday installing alarms and sharing critical fire safety info. Our Long Island team was also out in the Hamptons and Huntington. Generous partners like Masbia Soup Kitchens and Assemblyman Simcha Eichenstein helped the Red Cross to provide comfort and care to four families following a fire in Boro Park, Brooklyn. Alongside our partners at Yonkers OEM, Metro New York North Red Cross volunteers were on scene of a fire on Monday providing emergency assistance to 25 adults, two cats and two dogs. On Saturday, more than 70 volunteers from our dedicated community partner MIRA USA came to our HQ to training in mass care disaster relief. 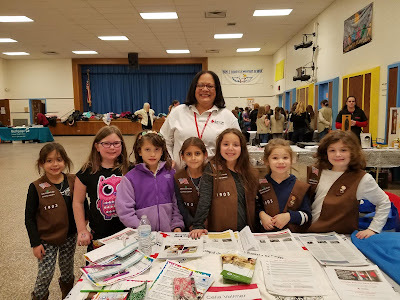 Last week the Greater New York Red Cross participated in Girl Scouts Career Night in Port Jefferson. Four Red Cross ERV teams provided canteening support for the funeral of FDNY Firefighter Steven Pollard in Brooklyn. On Thursday, PIX 11’s Nadia Ramdass helped to share this touching reunion between two Red Cross volunteers and a Crown Heights family they helped get back on their feet after an apartment fire destroyed their home. The Kiwanis Club of Manhasset-Port Washington presented a donation to Long Island Long Island during a luncheon meeting at the Port Washington Yacht Club. We had a great visit with the honorable Senator Joe Addabbo. Joe graciously recorded a public service announcement advancing our Home Fire Campaign to help us reach as many of his constituents as possible. Jan. 18, 22: Red Cross blood drives will take place from 2 to 7 p.m. at the Greater NY Red Cross building located at 520 West 49th Street, Manhattan. Schedule an appointment to donate today! Jan. 19: Get your tickets today for the Fine Wine & Food Festival on Long Island. FWFF has once again partnered up with the American Red Cross through its Corks for Charity program and will donate a portion of all ticket proceeds to Disaster Relief. Feb 18: We are holding a 2-hour class on the history of the Fundamental Principles of the Red Cross and Red Crescent Movement and how they were developed based on the Movement’s experience responding to suffering and needs over the previous century.